This school year began with changes in the intervention hallway. 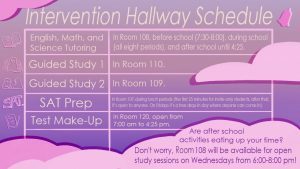 These changes consist of the combination of math, science and English tutoring in Room 108, the movement of Test Make-Up to Room 120, and the addition of the SAT prep room in Room 107. The math, science and English tutoring room now includes various AP prep books. Starting Sept. 5, the tutoring room will also be open from 6-8 p.m on Wednesdays to provide an additional opportunity for students with after school activities to study. Previous story QUIZ: What type of activity is a good fit for you?